100% of you, my dear readers, would know this castle by a different name, which I would state at the end of this post. – It is located in Romania. – It is originally built in 1212, so it’s over 500 years old. – Over the years, it was used as a fort, a customs post and a royal residence. – At the moment, it is opened to tourists and functions as a museum of midevil arts. – Have you guessed, the other name which makes this castle a tourists attraction? 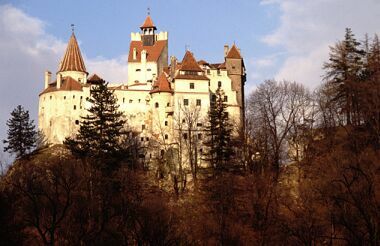 – It’s commonly known as Draculla’s Castle as it belonged to Vlad II Dracula once. .. Yes, It’s the well known Draculla Castle.. In an animated cartoon known as ‘Ka3bool’, there was a funny episode where the protagonists visited this castle, and they fought Mr. Draculla with garlic gloves. Did I mention that Draculla in that episode can only turn to a fly? I believe my fellow Arab readers would remember that anime. – and believe it or not. If you have $135 million to spare, you can buy this castle. Yes, the Castle is on sale. so guys start saving so that one day, you can own a piece of history. Hmm, I don’t know how many years/decads will it take me to place a deposit. Ooops ! Just short of a few dollors … i think i’ll pass ! Who wants to be bitten by a Vampire anyways ! BTW have you seen the movie “Fearless Vampire Killers” … watch it … its hilarious …. i cant psot reply to word press blogs from my laptop …strange ! 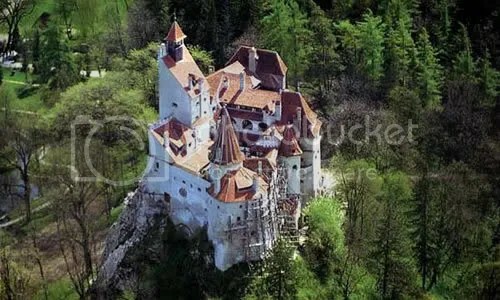 I know, Who would believe that ‘The Dracula’ lived in a a bueaty like this… Don’t worry about the double. But, Would you place an offer? Why not, Grey? If you are bitten by a vampire , you would live for ever.. It’s amazing, just imagine the things you can do without worrying about death and lack of time. On the other hand, Eternity is not my thing, It might be interesting to have that ability at first, but I would get bored of it after few years. Never heard of the movie before… I have watched ‘Interview with the Vampire’ & ‘Queen of the Damned’. Loved the former, and hated the latter. I will do a search of the movie you mentioned and see if I can locate a copy …Thanks Grey on your enthusiasm on commenting. P.S: I don’t know why word press didn’t allow to be shown immediately, It had to go through moderation. No idea why it happened? I Like your concept, but costly , don’t you think? !